Your document is edited using the Microsoft Word track changes feature. This is a standard feature installed in current versions of Microsoft Word. This Microsoft component allows you to quickly accept all changes proposed by the editor or move easily between corrections. Comments, corrections, and suggestions, which are listed in the right-hand margin, are easy to identify and accept into your document. Our staff of expert editors has passed a comprehensive proofreading test; Proof-Reading.com is extremely selective when hiring editors. We do not have hundreds of faceless contract editors; Proof-Reading.com employs a small staff of editors, and each is highly respected in the industry. We are confident you will be 100% satisfied, and we offer a money-back satisfaction guarantee. 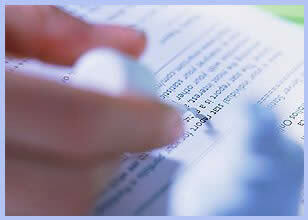 If you are unhappy with your edited document, we will refund your payment or re-edit your document gratis. Proof-Reading.com guarantees the security of your business document and credit card. We have a Norton Secured Secure Server ID, and all documents and payments are sent over a Secured Socket Layer (SSL), protecting you against credit card and document theft. Documents travel over our encrypted network, and are destroyed after thirty days. We take every precaution to ensure your total privacy and security. Proof-Reading.com proudly awaits the opportunity to serve your proofreading needs!